Not much text yet, although I might add some sooner or later. 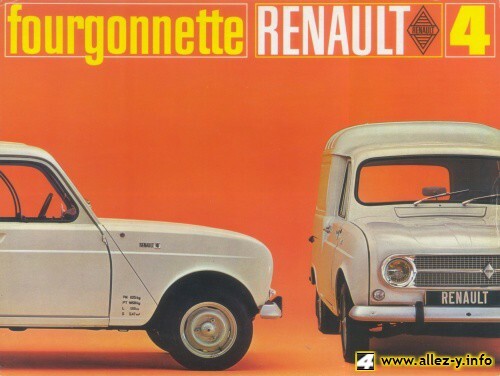 For the first 15 years or so there is one each year, and they are rather well in line with the berline brochures. 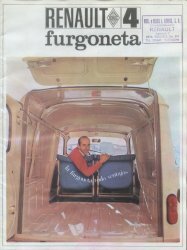 A more comprehensive overview of Spanish Furgoneta brochures is here. 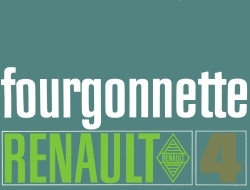 More fourgonnette brochures can be found in the Brochure finder page. 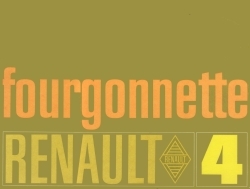 1962 - 1963. 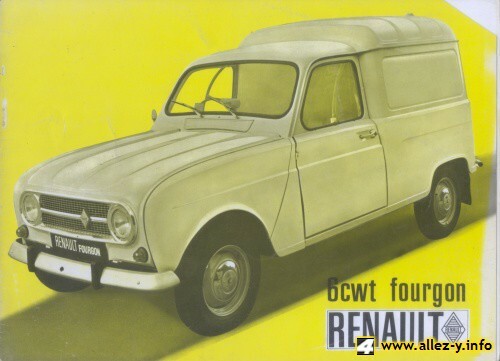 This brochure probably gave the 'girafon' its name. 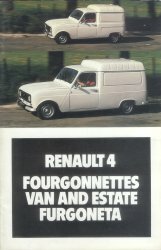 On the right, from about the same year, another one in black and white (a second version with white text exists, too). 1962. 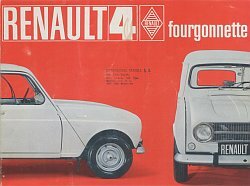 A small folded one too. 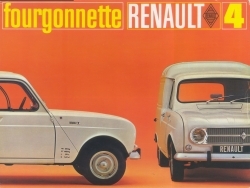 On the right a 1963 German brochure, combining the berline and the fourgonnette. 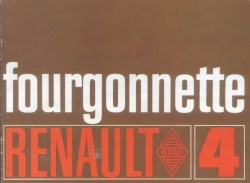 1964-1966. 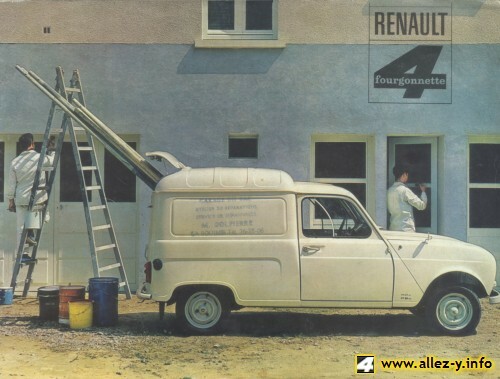 Renault often emphasizes the multiple use of the Fourgonnette (utilitaire toute la semaine, touriste le dimanche); on the front page it is used by painters, on the back side to go out in the weekend. 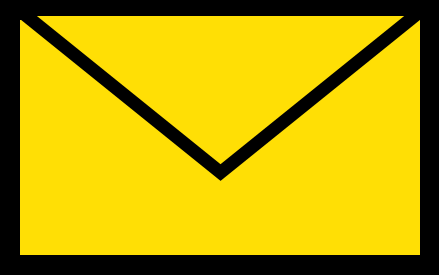 On the right hand side the small version is shown. 1967. 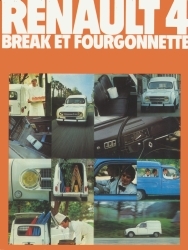 A simple brown cover, of which also a small version exists. 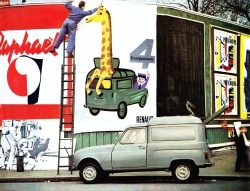 The design of the brochure range for 1967-1970 is very similar to that of the Berline equivalents. 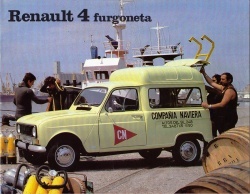 To the right the Spanish equivalent: 'la furgoneta todo ventajas', or 'the all advantages fourgonnette'. 1969 Design similar to the 1969 Berline brochure. 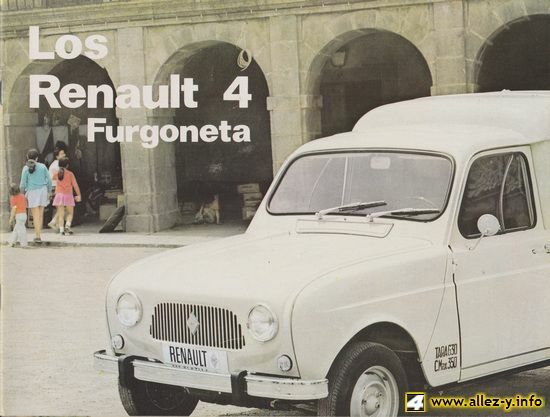 On the right a 4-page leaflet from Mexico, where apparently the Fourgonnette wasn't called Furgoneta, like in Spain. 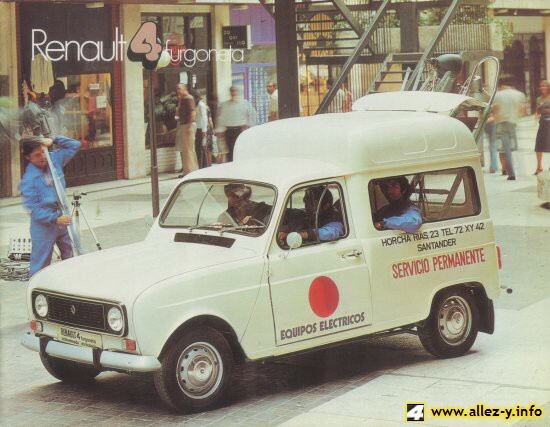 It was produced by Diesel Nacional, S.A. (Dina). 1970 Someone found it important to switch the '4' and the logo. 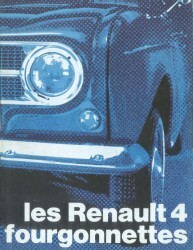 On the right, the UK version. 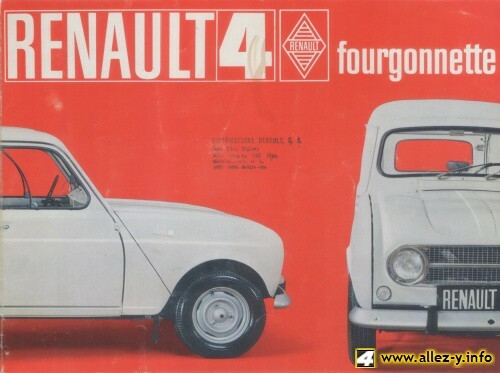 Here, the Fourgonnette is called '6CWT Fourgon' and is sold with chrome hubcaps. Only on the inside, for some reason the rear wing has been photo manipulated. 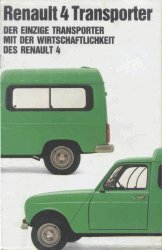 1971 Design very similar to the Berline brochures from the same name although different in color: orange and grey versus orange and green for the berline. 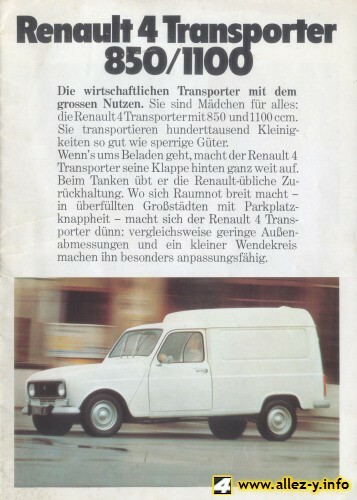 Note the orange indicator light although the brochure is not the German version. 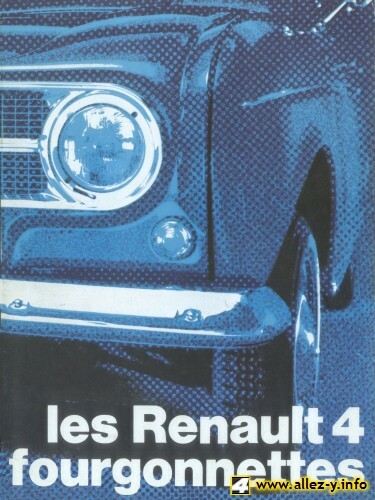 1972 Design very similar to the berline brochure from the same year although different in color: blue versus red for the berline. 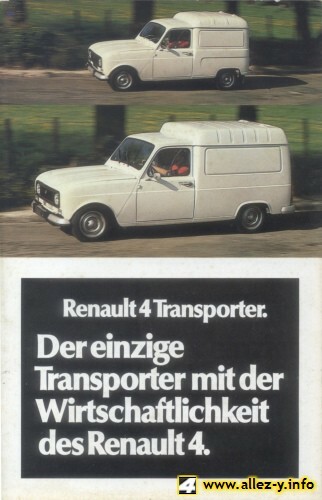 1973 In design very similar to the berline brochure. 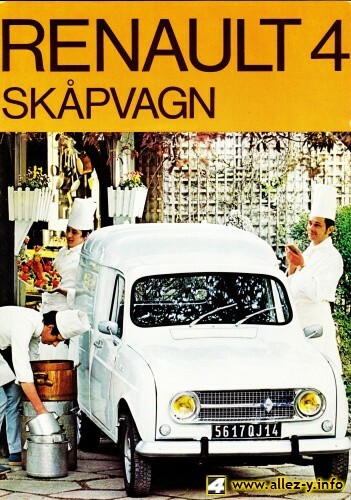 The cover of the Swedish version is more or less the same, but, of course, on the inside not entirely: the blue vitrée is not available in Sweden. On the other hand the Sûrélevée is shown, so probably available. On the right hand side the FASA equivalent (pictures inside this brochure indicate that in this year FASA combined the first grille with the seventies logo!). 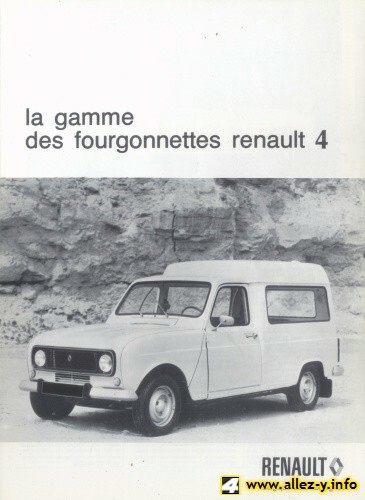 1974 Similar to the brochure of the previous year. Nice examples of photo manipulation concerning the new 1974 logo are shown here. In Argentina, a country for those who love fierce bumpers, the new logo is also introduced on what is called the 4F. On the right, the UK brochure for the same year is completely different. 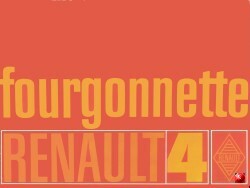 Chaos from now on as in France Renault ceases to publish yearly brochures about the fourgonnette alone. 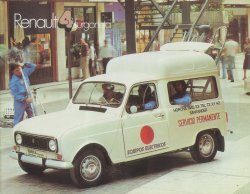 Instead, they are sometimes included in 'Utilitaires' brochures, among with the Estafette or, later, the Express. 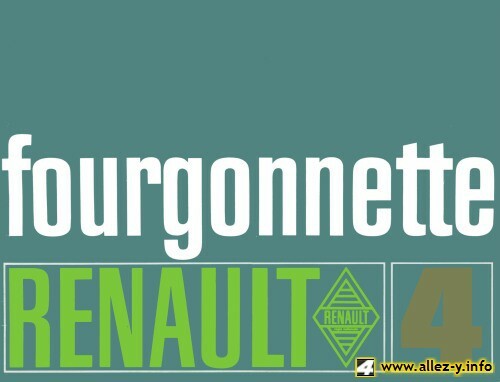 During later years, only few were published about the fourgonnette alone. 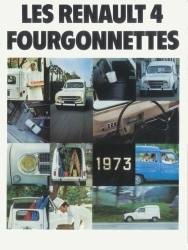 Other countries did keep on publishing fourgonnette brochures, like Spain. 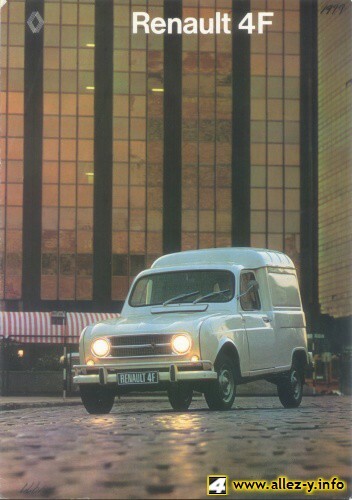 For instance, this is the 1975 UK brochure. 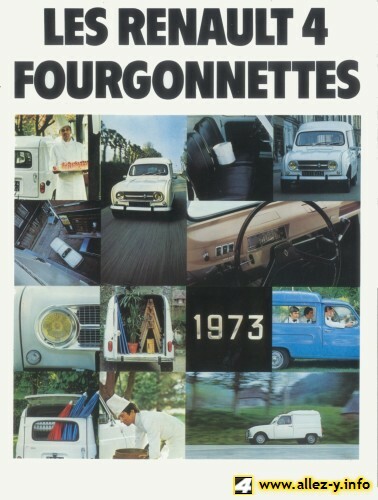 1976, an important year as the Fourgonnette Longue was introduced, that was later to become the F6. 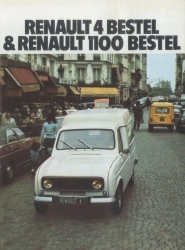 In Dutch it is called '1100 Bestel'. 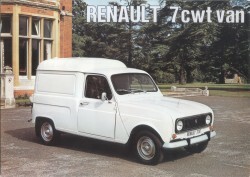 The belgian and German ('1100 Transporter') versions show it, too. 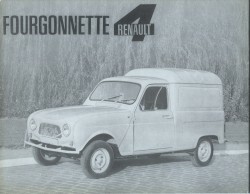 The Fourgonnette Longue is still quite different from what it would soon become, with the round indicator lights and metal air inlet. 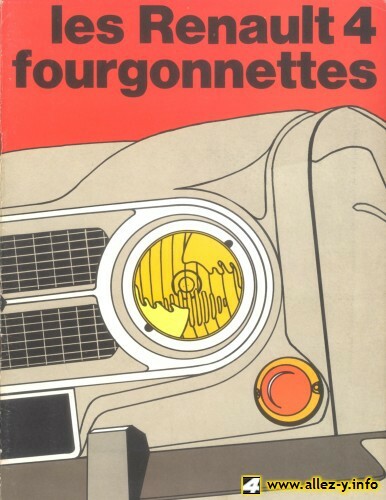 Alas, no French version here. 1977, the German brochure shows the Fourgonnette and F6, in Germany still named Transporter, which now has the white rectangular indicator lights, and still the metal air inlet. 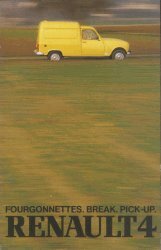 The bumpers are metallic, but not chrome. On the right, a special version of this brochure as it is fully tri-lingual: French, English and Spanish. 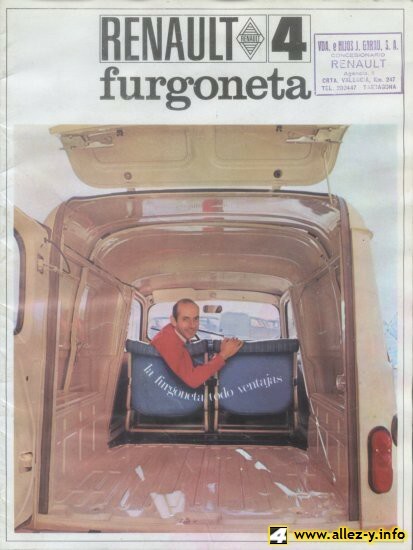 1978, a nice Spanish Furgoneta. 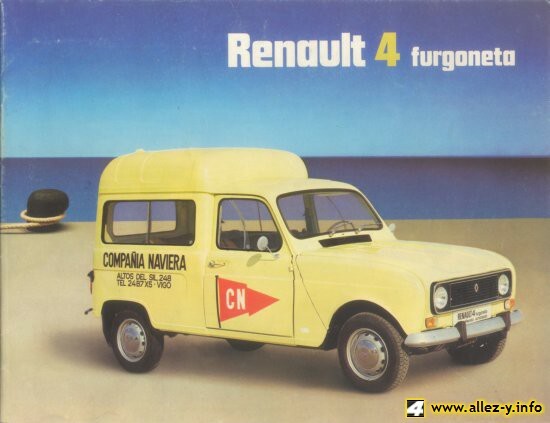 1979, again from Spain. 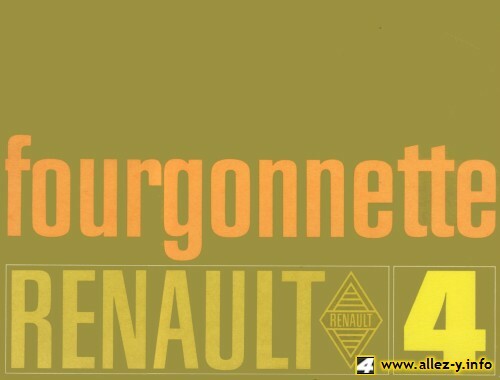 From this year and 1980 I have a couple of different ones, all showing the Furgoneta in a very nice yellowish color (with amazingly similar types of company logos...). 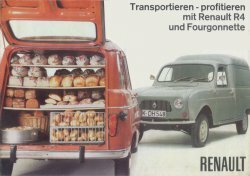 On the right hand side an example from Germany, very much in line with the berline brochure from the same year. The bumpers are now plain grey, as on the GTL. The small brochure is also from Germany. 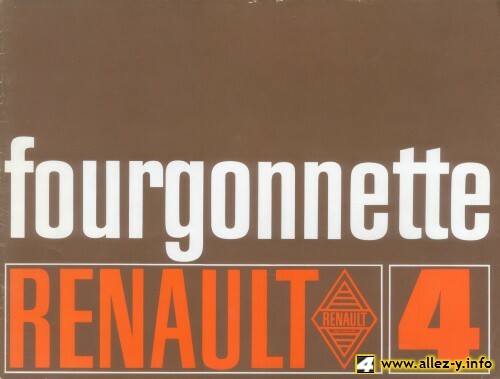 1980, again a Furgoneta in this very nice yellowish color. 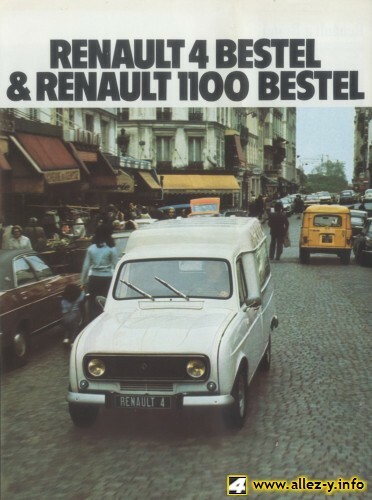 1980, one of the few years for which a French brochure exists.